"Burns, Baby Burns" is the fourth episode of The Simpsons' eighth season. It originally aired on the Fox network in the United States on November 17, 1996. Mr. Burns' long lost son Larry returns and although they at first get along well, Mr. Burns begins to see that his son has turned out to be an oaf. It was directed by Jim Reardon and was the first episode written by Ian Maxtone-Graham. It guest starred Rodney Dangerfield as Larry Burns. The Simpsons are balloons that float to the couch and pop one by one. Mr. Burns and Smithers take a train back to Springfield after attending the annual Harvard-Yale football game. The train makes an unexpected stop and a man named Larry comes up to the train and tries to sell souvenirs. He sees Mr. Burns and takes out an old picture of a man who looks similar and compares the two. Suddenly the train pulls away, leaving Larry behind. Meanwhile, the Simpson family are on their way home from visiting a cider mill and see Larry hitchhiking. After much discussion, the family picks up the hitchhiker. Larry asks the Simpsons about Mr. Burns and they agree to take Larry to his house. In Springfield, Larry visits Mr. Burns' estate and reveals that he is Burns' son. Mr. Burns is at first shocked, but after acknowledging the resemblance admits that Larry was the product of a one-night stand with the daughter of a former flame at a college reunion. At first, Mr. Burns is overjoyed to have a son and tries to shape Larry after himself. Burns takes Larry to fancy parties and tries to have him enrolled in Yale, but Larry keeps acting like an oaf and proves to be an embarrassment. Larry is put to work in Sector 7G at the Springfield Nuclear Power Plant alongside Homer and the two become friends. Larry invites Homer to dinner, and at dinner, Mr. Burns becomes frustrated due to Larry's boorishness and tells him that he wishes he had no son. Homer tries to convince Larry to fake a kidnapping so that Burns will admit that he loves his son, and although Larry at first opposes the idea, he eventually agrees to do it and moves into the Simpsons' basement. Homer calls Mr. Burns and says that he can have Larry back if he admits that he loves him. Marge discovers the plan and convinces Homer and Larry to abandon their plot, but as they leave the house, they are spotted. The two are chased into a cinema where they climb out onto the marquee and have a brief standoff with the police. Homer gives a heartfelt speech to justify Larry's actions and Mr. Burns forgives them for the hoax, but explains he cannot be the family whom Larry needs. Larry understands and announces that he has a wife and children back home who are probably worrying about him. Burns and Larry say their goodbyes and the people of Springfield party outside the cinema. 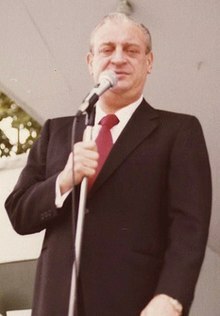 Comedian Rodney Dangerfield voiced Larry Burns, whose design was a mix between him and Mr. Burns. Ian Maxtone-Graham wrote the episode and it was his first writing credit for The Simpsons, although he had served as a consultant on the show for several months. Maxtone-Graham had previously worked with showrunners Bill Oakley and Josh Weinstein on a game show and the two had wanted to hire him as a writer on The Simpsons. The episode started out as a story about Mr. Burns and Grampa both being stationed in Paris during World War II and falling in love with the same woman, who had a love child. Maxtone-Graham had wanted this episode to be about Burns having a child, which is where it went. The other episode idea became 'Raging Abe Simpson and His Grumbling Grandson in "The Curse of the Flying Hellfish"', which aired in the previous season. The episode opens with the family visiting Mt. Swartzwelder Historic Cider Mill (a reference to fellow writer John Swartzwelder) because the writers had wanted to do something involving autumn and a cider mill seemed like a good setting for that. Rodney Dangerfield guest stars in this episode and was a huge favorite of many of the show's writers. Many of the jokes in the episode were specifically written to be "Dangerfield jokes", which were much tougher to write than the staff had originally thought. Dangerfield made a few key changes to his script during the recording of his part; Weinstein kept the annotated script and pen and considers them among his three most prized The Simpsons possessions. Designing Larry Burns was a challenge because the director had wanted him to look like Dangerfield but still have Burns' characteristics such as the pointed nose. The title of the episode is a reference to a line in the Trammps song "Disco Inferno" ("Burn, baby, burn.") After discovering that Larry Burns is also working in Sector 7G, Homer frantically cleans up and puts away an almost entirely assembled jigsaw puzzle which has an image of Snoopy the dog lying on his doghouse. The puzzle is missing several pieces over where Snoopy's nose should be, which was intentionally drawn that way to avoid copyright laws. The character from Yale that Mr. Burns briefly talks to is based on the fictional character Dink Stover from the book Dink Stover at Yale by Owen Johnson. The episode contains several references to the film Caddyshack in which Dangerfield stars, such as the scene where Larry tries to fit in with Mr. Burns' associates. The final street party, which features the song "Any Way You Want It" by Journey, also parodies the way that several films, including Caddyshack, end. The episode ends at a movie theater, which is a reference to several famous criminals who were involved with theatres, such as John Dillinger, Lee Harvey Oswald, and John Wilkes Booth. In its original broadcast, "Burns, Baby Burns" finished 64th in ratings for the week of November 11–17, 1996, with a Nielsen rating of 7.7, equivalent to approximately 7.5 million viewing households. It was the fourth-highest-rated show on the Fox network that week, following The X-Files, Melrose Place, and Beverly Hills, 90210. The authors of the book I Can't Believe It's a Bigger and Better Updated Unofficial Simpsons Guide, Warren Martyn and Adrian Wood, called it "A fun episode, with Rodney Dangerfield putting a lot of pathos into Larry – and Homer's impassioned speech atop the cinema at the climax is one of his funniest moments." ^ a b c d e "Burns, Baby Burns". BBC.co.uk. Retrieved April 10, 2007. ^ a b c d "Burns, Baby Burns". The Simpsons.com. Retrieved April 10, 2007. ^ a b Maxtone-Graham, Ian (2006). The Simpsons season 8 DVD commentary for the episode "Burns, Baby Burns" (DVD). 20th Century Fox. ^ a b c d e f g h i j Weinstein, Josh (2006). The Simpsons season 8 DVD commentary for the episode "Burns, Baby Burns" (DVD). 20th Century Fox. ^ Reardon, Jim (2006). The Simpsons season 8 DVD commentary for the episode "Burns, Baby Burns" (DVD). 20th Century Fox. ^ Meyer, George (2006). The Simpsons season 8 DVD commentary for the episode "Burns, Baby Burns" (DVD). 20th Century Fox. ^ Bauder, David (November 24, 1996). "'Dallas' gives CBS a boost NBC wins again with 8 of top 10 in sweeps period". The Sun Herald. p. F8. Wikiquote has quotations related to: "Burns, Baby Burns"
"Burns, Baby Burns episode capsule". The Simpsons Archive.